A Dubuque man convicted of the brutal stabbing death of his girlfriend admits he assaulted another inmate at the Dubuque County Jail. Twenty-eight-year-old Eddie Hicks was found guilty in November of stabbing his girlfriend 115 times and knocking her teeth out with a skillet. 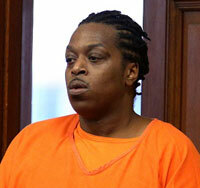 Hicks had argued he killed the woman in self-defense. The judge who ruled on the case noted Hicks had talked weeks before the murder of smashing his girlfriend’s head “like a pancake” and killing her.